Oh that’s right… fantasy football is right around the corner and the best part of fantasy football season is draft time. To help you crush your league mates at your draft, we’re bringing you our free 2014 fantasy football rankings that we’ll be rolling out over the next two weeks position by position. To make it easier to keep track of we’ll keep a list of them on our appropriately named 2014 Fantasy Football Draft Rankings page, which can be found in the blue navigation bar thingy above. Kicking things off for the 2014 season are our quarterback rankings. If you had Peyton Manning last season, congratulations! I’m sure you annihilated your league just like Peyton did to just about every passing record imaginable but if you’re thinking about spending a first round pick on a QB in 2014, you might want to reconsider. This year’s list of signal callers is deep, and I mean VERY deep with potential starting QB options way down in to the 20’s in my rankings. With so many good starting options this season, the odds are I’m not paying a high draft price to grab any of the top tier QB’s but as a whole quarterbacks are stable and reliable so I won’t mock you if you do (or maybe I will… we’ll see). With all that said, let’s get started! Who Are The Top Quarterbacks in Fantasy Football for 2014? 1. 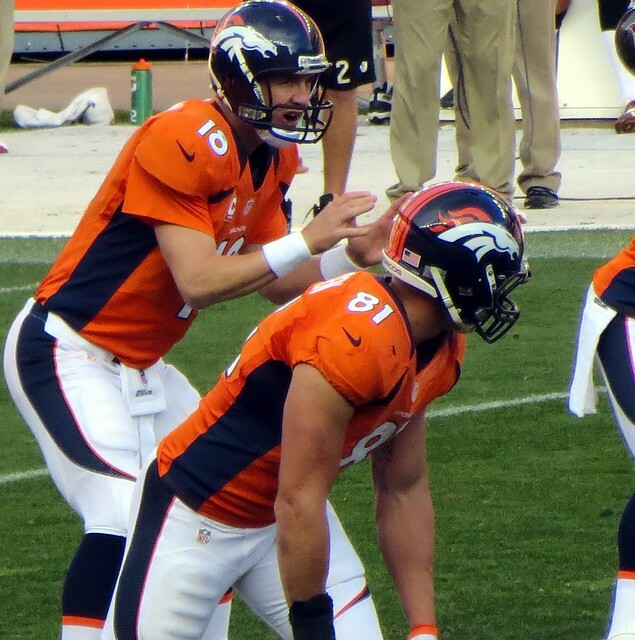 Peyton Manning, Denver Broncos – Name any passing record and Manning probably broke it last season, on his way to the best quarterback performance in fantasy football history. In 2014 it would be foolish to think he could top it, especially with Eric Decker in New York, so don’t expect another 55 touchdowns, but Manning is still a good bet to lead the league in scores once again. Peyton’s surgically repaired neck is still a concern, and the Broncos lost Eric Decker to the Jets but Denver reloaded with Emmanuel Sanders and rookie Cody Latimer, and they still have Demaryius Thomas, Wes Welker and Julius Thomas, so Manning is a good bet to repeat as the top overall QB this season. 2. Drew Brees, New Orleans Saints – Just another 5,000-yard season from the most reliable quarterback in fantasy… ho hum. If you’re looking for consistency on your fantasy team then Drew Brees is your guy. The Saints are always in the top 5 in pass attempts, which limits any downside he has and the Saints are still loaded with weapons so he’s a good bet to post another top 3 year. The Jimmy Graham contract dispute is a little concerning, and is something to keep an eye on. If Graham holds out for any length of time I may drop Brees a spot or two, but for now draft him as the cornerstone of your fantasy franchise, but be ready to spend a high draft pick on him. 3. Aaron Rodgers, Green Bay Packers – Last year was a rough year for Rodgers, missing seven games with a broken collarbone suffered against the Bears in week 8. Prior to the injury, Rodgers was good, but not his usual dominant self, ranking just seventh in fantasy points over the first seven games. An injury to receiver Randall Cobb could explain some of the drop. 2014 looks bright for the Packers with Rodgers and all of the Packers receivers healthy, an impressive crop of rookie pass catchers, Eddie Lacy in the backfield, and an increased emphasis on the pass game. Rodgers has a ton of weapons around him and he remains one of the league’s best fantasy quarterbacks and is worthy of his early draft spot. 4. Matthew Stafford, Detroit Lions – For the first 13 weeks of the season, Stafford trailed only Peyton and Brees in fantasy points, but in true Stafford style he posted a pair of clunkers in weeks 14 and 16 and likely knocked his fantasy owners out of the playoffs. Stafford puts up elite numbers every year but he relies on a heavy passing volume for his stats which leads to a lot of volatility in his week to week output. His 7.33 yards per attempt average is a little concerning as well, especially if the number of attempts decrease. Fortunately new coach Jim Caldwell has been known to air it out, and the additions of Golden Tate and rookie tight end Eric Ebron, along side Calvin Johnson, can only help Stafford’s numbers. All in all, Stafford is a solid QB1 with big upside, but as any Lions fan can tell you, he can be very maddening at times. If he can find more consistency this season he would join the top tier of fantasy quarterbacks. 5. Robert Griffin III, Washington Redskins – Coming back too soon from an ACL injury, RGIII was not the same player we saw in 2012. Despite his struggles, Griffin was still a borderline QB1, ranking 13th among quarterbacks through the first 14 games of the year before Mike Shanahan benched him in week 15. Super-human freaks like Adrian Peterson aside, players usually bounce back from ACL injuries much better in the second year and I expect him to be closer to the 2012 RGIII than player we saw last year. Griffin will need to learn new coach Jay Gruden’s system this off-season, but he seems to be a quick study, and let’s not forget that this is a system that made Andy Dalton fantasy relevant. RGIII and Matt Ryan are my favorite QB targets this season (both having a 6th round ADP), and while Ryan should be good, RGIII is the best pass/rush combo in the league and because of that, he has a chance to be the #1 overall quarterback at year-end. If he comes at any sort of discount in your drafts be ready to pounce… this may be your last chance to buy him this low. 6. Matt Ryan, Atlanta Falcons – The Falcons came in to 2013 as Super Bowl contenders, and left an wounded mess. Ryan lost his best receiver (Julio Jones), his best lineman (Sam Baker), his running back (Steven Jackson), his second best receiver (Roddy White) was playing hurt all year and his 37 year old tight end (Tony Gonzalez) was playing through a toe injury. With all that chaos around him, Ryan still finished the season 4th in the league in passing yards and top ten in touchdowns. In 2014, the Falcons are mostly back together (except for the retired Gonzalez) and assuming everyone stays upright, Ryan has a good chance to move in to the elite tier of fantasy quarterbacks. His low ADP screams value, and he’ll be one of the QB’s I’m targeting heavily this season. 7. Cam Newton, Carolina Panthers – The fantasy community seems ready to write off Newton in 2014, claiming that the loss of Steve Smith, Brandon Lafell and Ted Ginn is just too much to overcome. Did anyone actually watch Smith, LaFell or Ginn last season? Last year none of them topped 745 yards receiving and none of them scored more than five touchdowns, yet Newton was still a top four quarterback at year-end. The Panthers still have Newton’s favorite target, tight end Greg Olsen, and they brought in Florida State rookie Kelvin Benjamin who, at 6’5”, gives Newton the big target he never had with the Panthers. The team also added veteran Jerricho Cotchery, who surprisingly (or sadly?) posted better fantasy numbers (602 yards, 10 TD) than any departing Panthers receiver. The one red flag I have is that Newton underwent ankle surgery in the off-season, and while he’s ahead of schedule, we’ll need to monitor his progress. If the rest of the fantasy community is running away from Newton, I see a buying opportunity. Newton’s rushing ability, especially his ability to score rushing touchdowns, limits his downside, and big passing numbers are just gravy. I’d be thrilled to have him as my QB1, especially if he drops. 8. Andrew Luck, Indianapolis Colts – What do you do when you have one of the most talented young quarterbacks in the league? If you’re the Colts coaching staff you run the ball a lot apparently. The Colts off-season moves indicate that they are focused on opening up the passing game more in 2014, bringing in former Giants WR Hakeem Nicks and rookie Donte Montcrief to give Luck a few more weapons. Luck has the ability to be one of the best (if not the best) quarterbacks in the league, and you only need to look at his 443 yard, 4 TD performance against the Chiefs in the playoffs to see what he’s capable of. Still, before Luck can take the next step in fantasy the coaching staff needs to open things up in the passing game and I’m still skeptical that this regime will make it happen. Luck will break out in a big way one of these years, and he makes a fine starter for your fantasy team, but I get the sense he’s being a bit over-drafted in 2014 and I’m tempering expectations until I see the team pass more. 9. Nick Foles, Philadelphia Eagles – After taking over the job full time in week 6, Foles was an MVP candidate and was second in fantasy points to Peyton Manning for the rest of the season. Foles set an NFL record for the best touchdown to interception ratio in history, throwing 27 scores against just two interceptions, and he tied another NFL record with seven passing touchdowns against Oakland in week 9. Chip Kelly’s offense is incredible and is making stars out of everyone involved, but the constant rumblings about the Eagles “upgrading” the quarterback position has me a little nervous that Kelly will have a quick hook if Foles struggles to start the year. Regardless, I want a piece of this offense wherever I can get it, and as long as he remains the starter, Foles makes an excellent quarterback for your fantasy team. 10. Tony Romo, Dallas Cowboys – Romo is one of my favorite fantasy quarterbacks to own because he always comes at a discount, and always posts reliable top 10 fantasy quarterback numbers. In 2013 Romo had a down year in passing yards (3,928), but he was fifth in the NFL with 31 touchdowns, which all told, ranked him as the eighth best quarterback in fantasy. There is an additional injury risk with Romo this season after he missed week 17 to have back surgery, but it looks like he is close to 100 percent, and should be ready for camp. We’ll monitor the situation through the pre-season just in case. The Dallas offense has a lot of really great weapons in Dez Bryant, Terrence Williams and Jason Witten, and their defense is one of the worst in the league, so they should find themselves in a lot of shootouts. Romo is a great value (as always) and is being drafted as the 13th quarterback off the board on average. If you like to wait on quarterback, he is a great one to target while you load up on the rest of your team. 11. Colin Kaepernick, San Francisco 49ers – Outside of week 1’s monster 412 yard, 3 TD game, 2013 was a mediocre year for the 49er signal caller, thanks in part to a pre-season achilles tear for his favorite receiver Michael Crabtree. Kaep is one of the best athletes in the game, and his rushing ability gives him a lot of fantasy value, but he 49ers need to pass more and he needs to be more consistent. This year Kaep has a full complement of weapons with the 49ers adding former Bills receiver Stevie Johnson, along with Crabtree, Anquan Boldin and Vernon Davis (as long as Davis doesn’t hold out), which should only improve Kaep’s, passing numbers. If you’re the type of drafter who likes to swing for the fences, this is your guy. Kaep is the biggest boom / bust quarterback in the league and his upside is enormous. If you draft him though you’d be wise to have a strong backup (Cutler, Ben, Rivers, etc) just in case. 12. Tom Brady, New England Patriots – The Patriots passing game was a mess last season, losing Rob Gronkowski, Danny Amendola and Shane Vereen to injuries and Aaron Hernandez to murdering people. For most of the season it was Brady and a handful of rookies and the offense never really seemed to hit its usual stride. While it’s easy to point the finger at the young players, Brady didn’t look as sharp as he normally did, but he did pull things together down the stretch and was a top three fantasy quarterback from week 12 on. This season Brady should have everyone healthy for at least the start of the year, and another off-season spent learning the Patriots complex passing game for Aaron Dobson and Kenbrell Thompkins should do them a lot of good. Assuming everyone stays on the field, there are a lot of reasons to expect a bounce back from Brady, but at age 36 it’s not a lock. He’s still a solid QB1 who can lead your team to the fantasy promised land. Brady will always get over-drafted in some leagues, but if he falls due to last year’s struggles I would be happy to draft him at a discount. 13. Jay Cutler, Chicago Bears – To be honest I kind of want to rank Cutler over Brady, and I may do just that before the season starts, but for now I’ll rank Cutler just outside the QB1 range in standard leagues. If not for Chip Kelly and Peyton Manning, we’d be talking about Marc Trestman’s Bears offense as the go to place for fantasy gold mining and Cutler looked nothing short of incredible in his new offense when he was healthy. Cutler has great weapons, a big arm, and the Bears defense is a shell of it’s former self so they should be in a lot of shootouts this season so another big season is easy to foresee. So why is Cutler ranked 13th? He hasn’t started 16 games since 2009 and the injury bug always seems to find him. Past injuries don’t always mean he’ll get hurt in the future, but it’s enough to prevent me from going all in, so we’ll rank him here for now. Draft Cutler as a backup if you can (looking at you Kaepernick owners) but don’t be surprised if he ends up a mid to upper tier QB1 at the end of the season. 14. Russell Wilson, Seattle Seahawks – Russell Wilson is one hell of a football player. He’s tough, he’s a good leader, and I have no doubts that he’ll be a multiple time champion and pro-bowler for years to come. That said, until the Seahawks open up the passing offense, he’s a better real football player than he is a fantasy player. Don’t get me wrong, he will have stretches where he plays like a QB1 – he did that last season – and his running ability gives him a high fantasy floor, but he will probably get over drafted due to post Super Bowl hype. Seattle was second to last in pass attempts in 2013 (420 attempts) preferring to run the ball and let their dominating defense win games. As long as that system works and they’re winning championships, they’re not going to change it. Wilson has good upside and will continue to progress as a passer, but I don’t see him making the leap to fantasy elite this season. If I was loading up on other positions and had him as my starter I’d be fine with it, but I’d rather have him as a backup instead. 15. Philip Rivers, San Diego Chargers – Left for dead by most fantasy owners after a horrible 2012, head coach Mike McCoy breathed new life in to the Chargers offense and Rivers went on to have one of the best seasons of his career. Rivers threw for nearly 4,500 yards and the most touchdowns he’s had since 2008 (32), finishing the year as the 5th ranked fantasy quarterback. With another year in the system, and some emerging weapons in Keenan Allen and Ladarius Green, there’s no reason to think Rivers can’t post another good year in San Diego. He is currently being drafted in the late 9th/early 10th rounds, so if you like to wait on quarterback, Rivers is a good player to target. 16. Ben Roethlisberger, Pittsburgh Steelers – Over the last eight weeks of the fantasy season (weeks 9-16) Roethlisberger trailed only Peyton Manning and Nick Foles in fantasy points, powered by six multi-touchdown games (including a four TD game vs the Pats) over that span. The Steelers lost Emmanuel Sanders to Denver in the off-season, but second year receiver Markus Wheaton and a healthier Health Miller are both capable of filling the void there. The Steelers are looking to use a no-huddle offense more often this season and there seems to be hints that an uptick in Ben’s pass attempts is coming. Ideally I would like to have Ben as my backup quarterback, but if my team is stacked everywhere else, or I had an injury to my starter, I’d have no problem rolling with him as my quarterback. 17. Ryan Tannehill, Miami Dolphins – In 2013 Miami’s offense was boring and predictable and they couldn’t run the ball at all so defenses loaded up on the pass almost all season. In spite of that, Tannehill threw for almost 4,000 yards and tossed 24 touchdowns (double his previous year’s total) behind one of the worst offensive lines in the league. Tannehill was a very raw player out of college, playing receiver for part of his college career, but he has made improvement every year in the pros and appears ready to take a big step forward. In the off-season the Dolphins brought in former Eagles QB coach Bill Lazor to install an up-tempo offense similar to what they run in Philadelphia. If Lazor’s offense resembles Chip Kelly’s in any way, Tannehill’s fantasy numbers could take a big step forward (think poor man’s Nick Foles with better wheels). I’m not ready to give Tannehill the nod as a QB1 just yet, but he has exciting upside and is someone I’m targeting as my backup wherever I can get him. 18. Johnny Manziel, Cleveland Browns – With ESPN legally obligated to mention him every 15 seconds, Manziel replaces Tim Tebow as football’s most talked about player. Unlike Tebow, Manziel can actually throw the football, and does it very well, but he also parties really well so there will always be questions about his focus on the game. For fantasy, Manziel possesses that ultra valuable passing/rushing combo that make players like Cam Newton and RGIII finish as top fantasy quarterbacks every year, so even if he struggles throwing the ball he should have a solid floor. Unlike Newton he doesn’t have a big frame so injuries will always be a concern with him. There are some rumblings about Bryan Hoyer opening the season as the starting quarterback but I’m not buying it. Hoyer is a career backup who had two above average games (one against Minnesota’s horrible pass defense) and Cleveland didn’t draft Johnny Football to stand on the sidelines with a clipboard. Like all rookies, I expect some ups and downs, and Josh Gordon’s looming suspension is a major buzzkill, but if Manziel finishes the season with QB1 numbers it wouldn’t shock me one bit. I love Manziel in dynasty leagues, but in redraft leagues I’m drafting him as a backup with big upside. 19. Andy Dalton, Cincinnati Bengals – You might be surprised that Dalton finished third in fantasy points last season, trailing only Peyton Manning and Drew Brees on the year, yet nobody wants to draft him. The Red Rifle started slowly but finished the season on a tear throwing multiple touchdowns in 9 of his last 11 games, including a five-touchdown performance over the Jets in week 8. Dalton has good weapons around him in AJ Green, Tyler Eifert and Giovanni Bernard, but the Bengals have already said they want to place more emphasis on the running game, so Dalton’s numbers are likely to take a step back in 2014. Dalton will also need to cut back on the interceptions after throwing 20 last season (5th worst in NFL) but if he can keep the turnovers in check Dalton could be a very solid backup or injury replacement in 2014. 20. Josh McCown, Tampa Bay Buccaneers – Based on talent alone, the veteran quarterback should be listed toward the bottom of the list, but this game is all about opportunity and McCown has it in Tampa. In Chicago McCown shined throwing to Brandon Marshall and Alshon Jeffrey and Tampa appears to be re-creating that twin towers scenario with Vincent Jackson and rookie Mike Evans. At the moment McCown is being drafted as the 28th quarterback off the board, but I like him much more than that. I would be happy to have McCown as a steady, reliable backup quarterback who could win you a few weeks if your starter gets hurt. 21. Jake Locker, Tennessee Titans – Unlike Russell Wilson, Locker is a much better fantasy quarterback than he is in real life. Locker is a great athlete with a big arm and the ability to pick up yards on the ground (things fantasy owners love), but his accuracy issues lose NFL games and drive coaches nuts. Locker has also been very injury prone throughout his short career missing 11 games last season with hip and foot injuries. When he’s on the field he has shown the ability to be a QB1 in stretches. From weeks 3-7 last season, Locker scored 29 pts, 22 pts – missed two games with a hip injury – came back with 25 pts. Just when it looked like he was on the verge becoming a trustworthy fantasy quarterback, then he threw in a clunker against a tough Rams defense and missed the rest of the season with a foot injury… typical Locker. While I wouldn’t want him as my starter, I’m very intrigued by Locker’s upside, he just needs to stay on the field. His 16th round ADP makes him an excellent backup for a reliable Manning/Brees/Rodgers type. If he can stay healthy, he’s fantasy gold, and if not you paid next to nothing for him so cut him and move on. 22. Sam Bradford, St. Louis Rams – After starting the season as a top ten fantasy quarterback through the first seven games, Bradford was placed on injured reserve with a knee injury. There was some speculation that the Rams would release him in the off-season, but apparently they saw enough to stick with him for one more season. The St. Louis receiving corps is a bit underwhelming overall, but does have some talent. Last year’s first round pick Tavon Austin has game breaking ability, and the talented but troubled Kenny Britt was reunited with coach Jeff Fisher in the off-season. There is some upside to owning Bradford, but the stars really need to align for anything big to happen. That said, Bradford has talent and his 14th round ADP makes it worth a dice roll to see if he finally lives up to his potential. 23. Eli Manning, New York Giants – I’m not going to sugar coat it… Eli was a complete disaster last season, leading the league with 27 interceptions, behind a line who couldn’t block for him. Queue the Manning Face. The Giants made some wholesale changes this off-season replacing offensive coordinator Kevin Gilbride and his downfield passing game with former Packers quarterbacks coach Ben McAdoo who will install a west coast offense instead. The team rebuilt their offensive line and also replaced underachieving Hakeem Nicks with a more reliable and polished receiver in rookie Odell Beckham, Jr. Eli clearly doesn’t have the arm strength he once had, so the west coast offense could be a good fit by getting the ball out of his hands faster. There is a chance that Eli could improve this year (how could he be worse?) but it’s hard to forget how awful Eli was for nearly two years now. Where Eli is drafted depends a lot on how he progresses in the new offense this pre-season but if you’re counting on him for anything more than a backup, you’re likely in for a big headache. 24. Joe Flacco, Baltimore Ravens – Despite his “elite” talk, Flacco is the definition of a league average quarterback, ranking 11th in yards, 19th in touchdowns, second worst in interceptions thrown, was sacked 48 times and he topped 20 fantasy points just four times last season. Sounds pretty elite right? In 2014 the Ravens have better weapons than they did in 2013 with a healthy Dennis Pitta and newly signed 35-year-old receiver Steve Smith, but there’s no real reason to expect a big uptick in Flacco’s stats either. Add to that the fact that their offensive line is still terrible, they’ll probably lose Ray Rice to suspension and don’t have enough in run game to keep defenses honest. Flacco is nothing more than a backup QB with a big arm in 2014 and is not someone I’m looking to target anywhere. 25. Carson Palmer, Arizona Cardinals – Palmer had a solid season in his first year in the pass heavy Bruce Arians offense. He set a career high in passing yards (4,274), and posted his highest touchdown total (24) since 2010. Unfortunately for fantasy owners he also set a career high in interceptions (22), which depressed his fantasy numbers and relegated him to backup status. Palmer is lucky enough to throw to one of the league’s best wide receiver tandems in Larry Fitzgerald and Michael Floyd, which gives him a high floor for fantasy, but his age and declining arm strength limits his upside. Reports out of Cards OTA’s have the offense looking much sharper than it did in Arians’ first season, which could mean a slight boost in Palmer’s stats for 2014. Although his QB1 days are well behind him, Palmer is still a serviceable QB2 and a good bye-week fill in or injury replacement. 26. Ryan Fitzpatrick, Houston Texans – Filling in for the injured Jake Locker in Tennessee, “FitzMagic” did an admirable job, putting up a higher point per game average than top QBs like Tom Brady, Matt Ryan, and Jay Cutler. Now the starter in Houston (by default), Fitz has better weapons in Andre Johnson and DeAndre Hopkins than he ever had in Tennesee or Buffalo. I’m not expecting QB1 numbers from Fitz by any means, but he’s a smart guy (Harvard… duh) and he did show the ability to put up decent numbers in the past and he should be serviceable this season as long as he keeps the job. If you’re in a super deep league or a 2QB league he should be on your radar as a good late round value. 27. EJ Manuel, Buffalo Bills – Last year, Manuel missed most of the pre-season and six regular games with a knee injury, which prevented him from getting in any sort of rhythm to start his rookie year. Manuel is a very physically talented player, with a big arm and the ability to run a little when necessary, so the potential to be a fantasy relevant quarterback is there. There is a lot of upside with both Manuel and the Bills as a whole, with a lot of young weapons including this year’s top rookie receiver Sammy Watkins, and last year’s second round pick Robert Woods, to go along with a deep backfield. This season the Bills are reportedly taking the handcuffs off Manuel and opening the entire playbook so it will be interesting to see how he develops. I’d be lying if I said I was fully on board because he’s still very raw, but I do like his upside so if you’re looking to backup a top QB like Manning or Brees, his 16th round ADP makes him an interesting pick. 29. Matt Cassel, Minnesota Vikings – Cassel was in and out of the Vikings starting job in 2013, but when he was in he was a bit of a surprising fantasy option throwing multiple scores in 3 of the 6 games he started and averaging over 17 fantasy points a game as a starter. In 2014 it’s clear that Cassel is keeping the seat warm for rookie Teddy Bridgewater, but the Vikes appear content to let Teddy hold a clipboard for now so Cassel gets his shot. The combination of Norv Turner’s downfield passing game, talented second year WR Cordarrelle Patterson and defenses stacking the box to stop Adrian Peterson could mean decent numbers for Cassel while he starts. In a standard league Cassel shouldn’t even sniff your starting QB spot but in a 2 QB league or super deep league he could post surprising numbers while he has the job. 30. Matt Schaub, Oakland Raiders – Coming off a 4,000-yard season, expectations were somewhat high for Schaub and the Texans in 2013, but instead Schaub became a turnover machine (9 INT’s in his first 5 games) and quickly lost his starting job while the Texans season went down in flames. Traded to Oakland for a bag of footballs in the off-season, Schaub gets a fresh start, but the Raiders receiving corps is a far cry from the weapons he had in Houston. Reports out of Oakland have Derek Carr already pushing Schaub for the job to start the season, and if he does I’ll probably put Carr here. Even if he starts the year with the job, it’s hard to see Schaub contributing to a fantasy team in all but extremely deep leagues.